Two men fighting in the middle of Sheffield city centre has sparked a big police response. Officers were called to York Street at the junction of Fargate at around 2.40pm today as a fight spilled from outside Santander Bank to the Sainsbury's Local loading bay around the corner. One eyewitness said a third man 'held a knife' to one of the assailant's throats before police arrived onto the scene. Shoppers and workers looked on in amazement as the two men traded blows. A riot van and four police cars arrived minutes after the fight broke out. The eyewitness said: "One of of the men was on top of the other hitting him and another man out of nowhere told him to get off him before putting a knife to his throat. "It was crazy, complete madness." Officers detained one man involved in the fight - it is not clear at this stage if any other arrests were made. 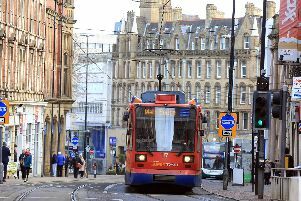 A South Yorkshire Police spokesman said: "Police received multiple calls from members of the public at around 2.40pm today (Friday 26 October) reporting two men fighting in the High Street/York Street area of Sheffield city centre. "Upon police arrival, nobody was found to be injured and individuals are being spoken to regarding breach of the peace. "Anyone with information that could help officers understand the circumstances surrounding the incident can call 101 quoting incident number 515 of October 27, 2017.